More than 100,000 copies later, this breakthrough program is more effective than ever—substantially revised and updated to include the author’s latest clinical research. For the more than 160 million overweight Americans, dieting is a failure. 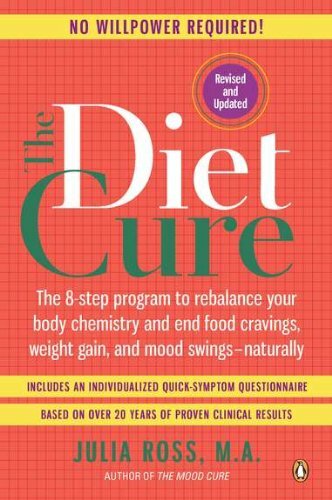 Based on more than twenty years of proven clinical results, The Diet Cure‘s revolutionary approach curbs food cravings and restores the brain’s mood and appetite chemistry in twenty-four hours. Beginning with her 8-Step Quick Symptom Questionnaire, celebrated nutritional psychotherapist Julia Ross helps readers identify their unique underlying biochemical imbalances and provides targeted strategies to correct those imbalances using nutritional supplements to jump-start the dietary overhaul. Readers then create their own safe, easy-to-follow plan to end low-calorie dieting and food obsessions for good.